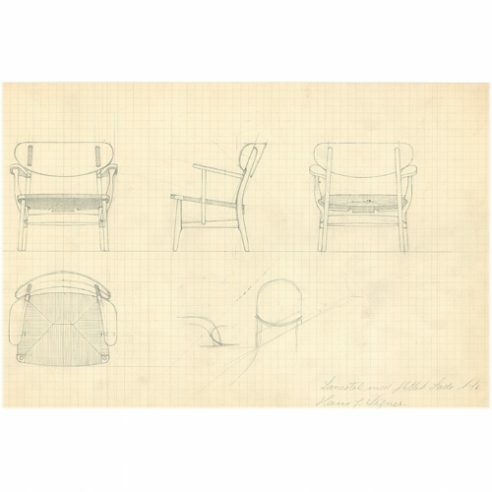 When first approached by Carl Hansen’s sales representative Elvind Kold Christensen to design for the company in 1950 Wegner drew several sketches incorporating ideas he had already developed some of which were to appear in his first designs for the chair maker based on the island of Funen. The design of CH26 dates to this period although documented in Wegner’s sketches was not put into production by the company. However it is clear that the chair shares common themes from Wegner’s lounge chair CH22, one of the first models Wegner designed specifically for Carl Hansen and Son during this period. as in his earlier Peacock Chair as is the use of finger joints at each corner of the seat frame and wedges to hold the front legs into place. The rustic looking armrests are held by axe shaped supports that thicken where strength is required where they connect to the chairs frame.